The Bouley Test Kitchen is a unique Event Space located in the Flatiron District. 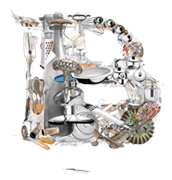 The Bouley Test Kitchen offers a variety of great layouts to meet your party’s needs. The multifunctional Test Kitchen serves as an elegant event space, an interactive classroom, and a state-of-the-art culinary laboratory. Audiophile A/V equipment with projection and full videoconferencing capabilities make this space perfect for private events, corporate/media events, photo/video shoots and, of course, cooking demonstrations. Bouley Test Kitchen seats up to 100 guests or 150 standing for a reception, featuring an open performance kitchen, Steinway grand piano & McIntosh audiophile A/V system. The Test Kitchen allows the Bouley team to develop and advance gastronomic approaches. Organic and bio-dynamic ingredients further new techniques driven by health and flavor. Bouley Test Kitchen can host seated events for 120 guests and cocktail receptions for up to 180 people. It’s unfolding layout blends the sophistication of a ‘Chef’s dream’ with a library of more than 8,000 cookbooks of inspiration; it serves as a reception area for passed canapes or small plates. The main dining room’s Steinway Concert B piano resonates under an 18th century Murano glass chandelier. Invited to observe the chefs’ techniques surrounded by 16th century copperware, a wall of slate connects guest to the kitchen, encouraged to chalk handwritten recipes or messages for special occasions. To personalize anniversaries or corporate events, state of the art color LED projection is available. The Test Kitchen also features handcrafted Nautilus speakers and an emerald illuminated turntable powered by the McIntosh Sound System and equipment from artisanal industry leaders like Molteni, Rational and Electrolux. As a cultural culinary center and interactive classroom, the Bouley Test Kitchen serves as an educational venue for guests to learn techniques from visiting chefs through lectures and demonstrations. Instruction encompasses all aspects of on hand cooking – selecting the right ingredients, creating dishes that complement one another and assembling a nutrient dense meal which can be recreated at home. One recipe can inspire 13 additional sub-recipes. Guests can observe for example, the testing of the guest chef’s new breads. Meilleur Ouvrier de France (MOF) bread master Jacques Mahou, work resulted in 30 new menu items, now utilized in Bouley at Home, private dining and off premises catering. Chef David Bouley’s goal is to help guests become better acquainted with their own signature in developing menus, the dish’s health components quantified with special dietary needs and allergies in mind.